Nadia and Charlie.. New eyes and a shape for the New Year! Hello lovelies! Here is a new and gorgeous set of eyes, ready for you on my Marketplace. As usual, they are released for Catwa and Vista, and of course, Omega. I test my eyes to work on Logo, Lelutka, Catwa, and Vista prior to releasing them as Omega. I want to be sure that they fit the eyes of each head, since each one has subtle differences. I know that sometimes, you get eyes that are omega appliers, but when you put them on they are off center or rolling back into your head. Because this has happened to me countless times, I decided I would not let that be the case with my work. And, for you shape lovers..I released Charlie, seriously gorgeous shape that fits soooo many skins! Ok, for now that is all.. there will be more to come in a few days. I do hope you all have a fun and peaceful New Years.. here's hoping we have more peace, more love and more tolerance in 2019.. It is Christmas Eve and I got up early to be able to release these Heaven Eyes today.. these are my own personal favorite of my creations. They are based on my own daughter's eyes. She is 12, amazing and lovely and has just the prettiest eyes ever <3 Yes, I am a very proud Momma! Ok, enough with the ruminating. I have a few pics and a few links to some of the newness, and I reccomend that you check out my in-world group and store. I get fairly "gifty" during the Holidays and love passing out unexpected things to my group members, so if you are not in the group and want to stay up to date and see whta other things I come up with, please join today! There is no joining fee, as of now, and gifts are put out at least once a month, but more as the creation bug strikes. And yes, it does use the outfit below! Decided to do a cute burlesque-type corset and pasties with a cute pair of red shoes and a ribbon collar to just tie it all up together. Perfect for .. well.. anything! Next is an uber awesome shape that I just LOVE... its thick an cute and just omg yummy! It is mod so you can always adjust the yumminess factor to your liking, but please do make a copy prior to that! And, also, I released another set of eyes. Firehoney eyes come in a hud for each Vista, Omega or Catwa. 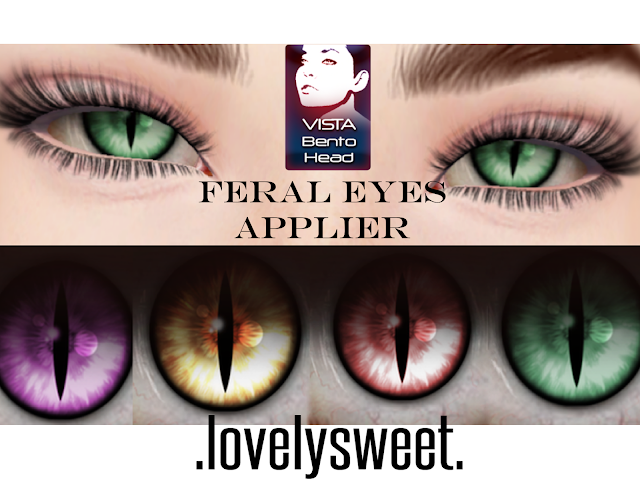 There are five colors to choose from.. and they are uber pretty :) Also, I test all my eyes in each head I make them for, so when I sell for Vista, I test them to look good on Vista heads, etc. There are some eyes that are not centered correctly when they use the Omega HUD, so rest assured that MY eyes will fit VISTA, Catwa, and Lelutka if you choose to get the OMEGA hud. Aaaaand..one of my absolute fave sets of eyes I've made is the Hailey Eye set... It is a mega-hud and has 16 colors and styles. Made for Omega, Vista and Catwa, each HUD sold seperately. And there is, of course, more there so please do yourself a favor and check out the rest of my marketplace, or, better yet, get to my in-world store and join my group, and get a cool set of poses for free as a group gift out now.. and since it is the Holiday season, I will certainly put out some other goodies for all my group members :) There is no group fee now as previously mentioned, so what are you waiting for! Thank you for your support, as always.. happy shopping! Gotta move it, move it.. The Boardwalk Home and Garden Event is in full swing, and if you haven't gone to see it, please go check it out! Awesome furnishings, decorations and even poses/pose props out for the coming holidays, as well as everyday. A great collection of SL furniture designers signed up for this event, and you really don't want to miss it! There is a little for everyone here, including this awesome workout mat from Abandoned Freight. This mat has yoga as well as other types of exercises like Pilates, and of course, it is a naughty mat as well! You can change the color of the mat too, to fit your decor. I've included a few other images below and a video too so you can see a sample of the animations. Enjoy! Do yourself a favor and go check out the event, which runs until Dec 15th... don't miss it! I decided another shape made for the Utilizator Normie Bento Head was in order.. this one is Lala, and she is curvy and sweet. I can't say enough about this head, given the extremely low price and the fact that it is Omega friendly makes it a great option for those new to Bento heads and who want to get something that is different than the more mainstream heads. All bento heads have some limits and have unique looks, even if you can edit them, they do retain their basic characteristics. I would say that the Normie head is more "youthful" than other heads. The skins you use on the head will also give it a different look. Because the head is Omega enabled, you can use Omega eyes, makeup and skins. If you own this head and don't know which skins would work with it, I highly reccommend trying 7 Deadly Skins, which are made with Omega appliers (typically based on Laq's Bento heads) and offer a nice variety of skin tones and looks. Also, Wow Skins work particularly well with this head, so look out for Wow skins Omega options as well. Halloween is coming and its time to get a little on the wild side..this set of Feral Eyes is perfect for all types of RP, or just to wear al the time if you want! These were made specfically for Vista Bento Mesh heads. I will have an Omega set out in the next week too! I own the Vista Zoe head and have been loving the ease of use, the great HUD, and the wonderful animations on the user side. On the creator side, I'm thrilled that it is such an easy head to make stuff for! And, it is Omega enabled, so that is a huge plus, so that you have wide choice of appliers available to you. However, it is still nice to be able to use appliers specifically for that head, so I went ahead and released these first. If you do not own the Vista heads, please do yourself a favor, and go try a demo! They are less expensive (by a lot) than most other popular mesh heads and have pretty much all the features that more expensive heads have. Don't get me wrong, I really do like my LOGO, Catwa, LAQ, and Lelutka, and Utilizator heads.. they all have something unique to offer and can be fun to use for different looks. I like to show the diversity though, and to let others know when there is a product that I believe is top-notch. everyone has their inner demons, the only difference is, I like mine..